Stores, secures, and charges any size tablet computing device or e-reader. Mounts virtually anywhere, or can be stacked or placed side-by-side without cord interference. Available in 10, 16, or 20 device capacity. Photo shows Tablet Depot™ with 10 unit capacity. The revolutionary Tablet Depot™ stores, charges, and secures any size tablet computers and/or e-reader devices. Perfect for training rooms, class rooms, or anywhere a space-efficient and HIPAA-compliant tablet computer storage and recharging device is required. The Tablet Depot™ can be permanently mounted virtually anywhere. 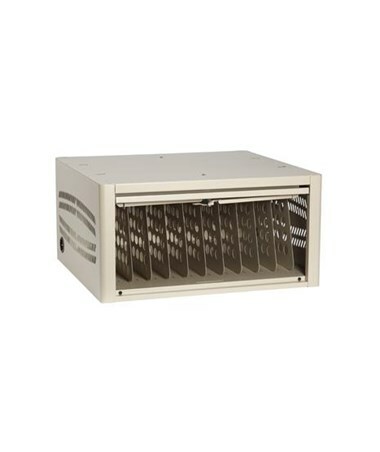 These units can also be stacked or placed side-by-side without cord interference - the perfect solution when you have a small to medium number of devices to store. Choose from 10, 16, or 20 device capacity to best suit your storage and recharging requirements. Each Tablet Depot™ is UL/CSA certified and comes standard with unique power-management features. Each Depot comes with a patent-pending Power Management Divider to keep power cords neatly arranged. The locking rear panel keeps IT cord configurations secured, while the locking recessed front door keeps stored tablets secure when not in use. 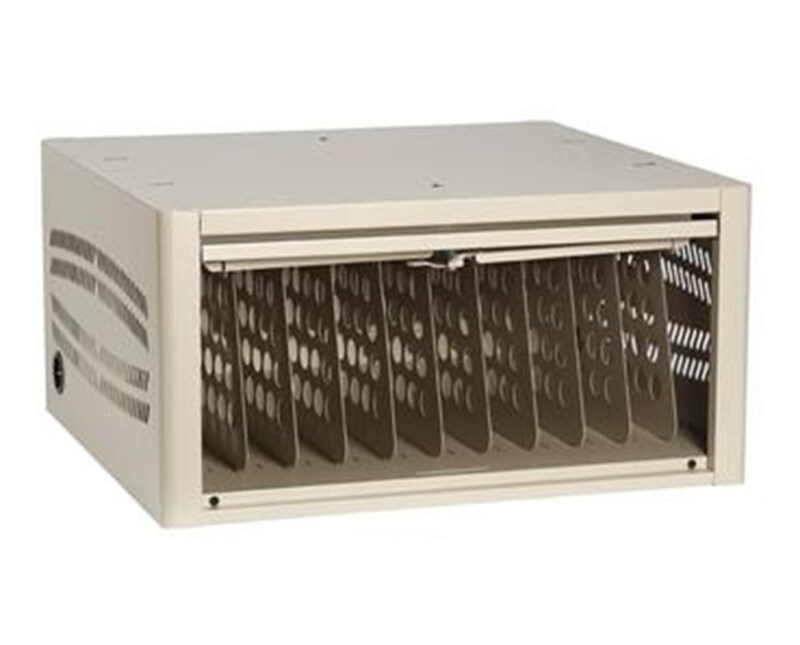 Durable powder-coated steel construction, and secure fold-down locking doors (keyed alike) provide safe storage, while the ventilation patterns on each side provide abundant airflow to keep tablets and e-readers cool. Contact one of our friendly, knowledgeable customer service representatives for additional colors and customization options, and for assistance with creating your own secure tablet storage solution! Locking rear panel keeps cord configurations secure. Locking front door is recessed and out of the way when open. 10, 16, or 20 device capacity. Width 14", 20", or 24"
Product Weight 30, 40, or 50 lbs.